Dupont West is undergoing rapid change. The Lansdowne Dufferin area has two major large-scale residential/mixed use development projects underway. Go has ideas to introduce a rail line with an overpass reaching heights 30 feet. The TTC Barns on Lansdowne are slated for demolition and redevelopment. All of this is proposed for a community struggling to develop and retain its own character amidst a long list of local concerns and issues. This project pools information, ideas and observations. It is intended to help develop an informed community perspective, to help guide change and to introduce our neighbourhood to the city at large. Dupont / Dyan Marie Projects presents art, art projects, architecture and landscape architecture that explores urban issues, ideas and reflections on contemporary cultural experience. 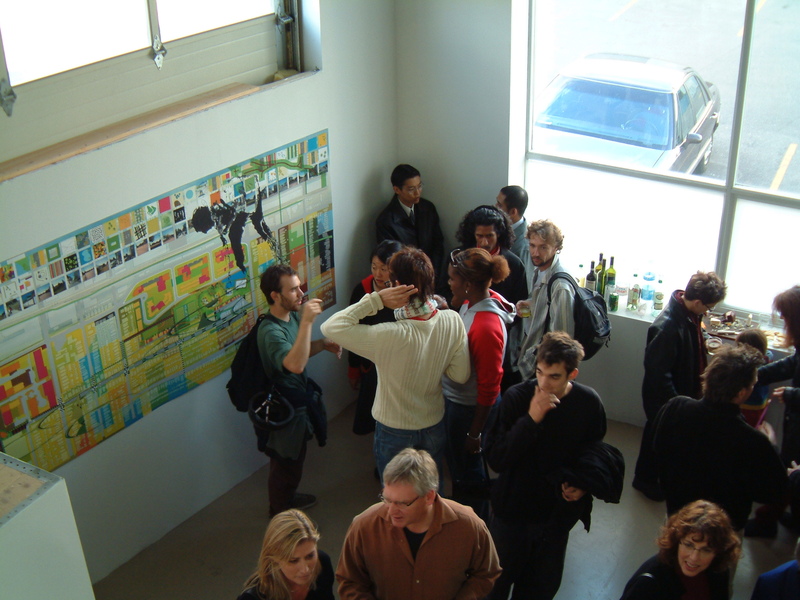 A new contemporary exhibition space, Dyan Marie Dupont Projects, area opens in Toronto September 17, 2005, at 1444 Dupont Street, Unit 31. It features curated and solo exhibitions that explore urban issues, ideas and reflections on contemporary cultural experience. Since 1997, Dyan Marie has focused her curatorial and artistic practices on the Lansdowne and Dupont neighbourhood where she lives. 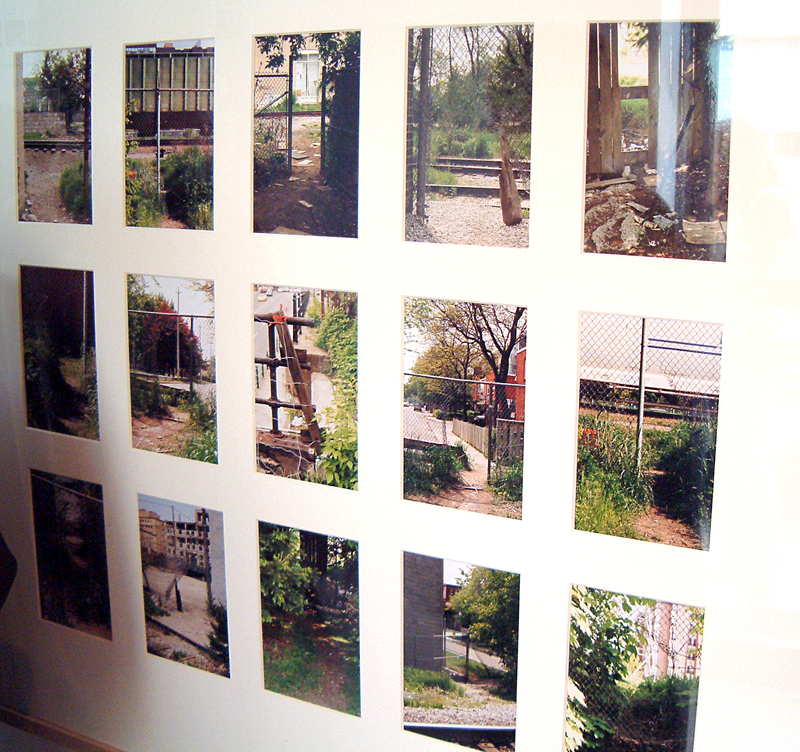 Marie has developed interventions and exhibitions that involve art and community activism, including About Here, which explored local development, Walk Here, which created an art-embedded walking system, and Look Out: Look Here, a project that promoted walking to reclaim neighbourhood streets after the brutal murder of a local child. Dyan Marie Projects builds on this background of neighbourhood vitalization work by introducing a cultural commercial space into an area caught between longstanding neglect and increasing pressure from developers of enclave bedroom communities. Dyan Marie Projects (founded as Dupont Projects) opens on the eve of the 20th anniversary of Cold City Gallery, a commercial artist-run gallery founded by Marie to exhibit the work of artists from the 1980’s Queen Street West scene. On September 17, Dyan Marie Projects opens a fall season encompassing art, architecture and landscape architecture. It begins with Under Construction a project exhibition that coincides with the construction of the gallery, the Canadian Art Gallery Hop and the Queen Street West Art Crawl. The process of creating artworks and the making of the exhibition space. “Jardin Imaginaire” will feature paintings based on Eugene Atget’s 19th century documentary photos, initially made for artists’ use, of fabled St-Cloud gardens just west of Paris. The images seek to recreate nature idealized. Natural compositions of trees, earth, water, and sky are juxtaposed with man-made elements of marble, stone, and stucco. Like an empty stage set, the gardens possess a theatrical quality and create the backdrop of a silent tableau. Pauline Choi is a Korean born Canadian artist based in Paris. Her paintings seek to capture the atmosphere of the natural world, exploring the contrasts between the light-filled open spaces and the shadowy world. Using light boxes and multiple layers of opaque oil paints on translucent mylar, they make vivid use of the interplay between artificial and natural light. Choi has shown her work extensively around the world and has been the recipient of many awards. She studied at the Ontario College of Art and Design before attending the graduate study off-campus program in New York. She then taught at OCAD for a few years before moving to Paris upon receiving the award for Cité Internationale des Arts. Once established there, she taught at the Parsons School of Design Paris. Choi has exhibited her work in Canada, Europe, and Korea. According to a recent UN study, 2007 marks the first point in history that the world’s urban population willoutnumber the rural population. The physical and cultural migrations resulting from this shift are explored in Constructed City – as a group of emerging photo-based artists interpret the new issues and challengesfaced within the burgeoning metropolitan centres. These artists have captured and portrayed the new urban realities by employing digital manipulation, staging, and by fusing the photographic medium with collage, paint, and sculpture. Illuminated themes include; pollution, consumerism, identity and communication. Adam Harrison is a Vancouver-based artist-photographer whose work is concerned with notions of visibility and invisibility in relation to the nature of art and photography, and of seeing as a visual phenomenon. His practice acts as a self-reflexive examination of how artworks might prompt a deeper consideration of art though an attempt to understand its fundamental aspects. ‘Making Work’, his upcoming exhibition at Dyan Marie Projects, features a series of photographs that depict the creation of various forms of art, including painting, drawing, sculpture and photography. Recent and upcoming exhibitions of Harrison’s work include the Belkin Satellite, Vancouver, Helen Pitt Gallery, Vancouver, Lee Ka-Sing Gallery, Toronto, and the Cooley Gallery, Reed College, Portland, OR. His work has been featured or reviewed in Lapiz Magazine, Toro Magazine, Ripe Magazine, NOW Magazine and Geist Magazine and was included in Carte Blanche, an anthology of Canadian photography published Magenta Foundation. In addition to his photographic practice, he is co-editor of Doppelganger Magazine, co-curator of CSA Space, and an active art critic. His writing on art has been published by Canadian Art, Fillip and Terminal City, as well as in various other publications, catalogues and artist monographs. Dyan Marie Project hosts Spot Culture initiatives to incubate art projects that appear as businesses in the store windows of Bloor and Lansdowne area where empty, failed and failing stores are common. GREENSPOTS.INFO WILD CULTURE | Urban Painting | Indigenous Seeds Now in progress: GSpots’ Vinepeople introduces green into spaces that are grey. This urban painting project began at the corner of Bloor and Lansdowne, Toronto, fall, 2006 and will grows into new sites where needed in 2007. Vinepeople are based on indigenous trees, plants and four species of vines found on walks in the local neighbourhood. AboutHERE.ca COMMUNITY MAGAZINE | Art | Activism | Small Business | Local culture PaintedApparel.com Painted Clothing for Exhibition | Performances | Re-use Painted Apparel invites you to participate by donating items especially for this project. Any good item in excellent condition will be very appreciated. Any item printed with a flowers pattern, in any condition, will be put to good use. A Dyan Marie Project curated with Pascal Paquette. GSpots. Horus. Miklos Legrady. Richard Mongiat. Some of Toronto’s best Graffiti artists paint with Toronto’s leading visual artist in a cross community event to celebrate the art of painting. Thank you to collaborator Pascel Paquette and the participating artists. Noel Harding and Richard Rhodes will talk about their work. Everyone invited and a special welcome to the Friends of the Visual Arts. The Elevated Wetlands are a “functioning sculpture” that creates a wetland environment within six giant polystyrene “animal-like” plastic containers located next to the Don River in Taylor Creek Park. The sculpture uses waste plastic as a soil substitute to mechanically filter water from the polluted Don River. Plants and trees that are commonly found in wetlands and have the innate capability of biologically removing pollutants from the environment have also been integrated into the sculpture. As the polluted water from the Don River passes though the sculpture’s interior, it nourishes the trees, pollutants are removes and exits as a waterfall of clean water. Powered by solar energy, the work creates a gateway into and out of Toronto along the Don Valley Parkway. (Photo collaboration Noel Harding and Michel Boucher Photography). Was… Oiseau Light illuminates the body as if on puppet strings. Found cardboard carved as abstractly being a sitting being. The mind hinged on living, funneling light in the wake. Chandelier Examines the moment between, the transition, the force of inside out. The transient nature of materials (cardboard boxes) places the tentative while the hanging light forces illumination upon mimicking light bulbs. A cluster and gathering of forces about to be just having been. With their passing light, vapour and air, skies hover as a shifting zone of alternate structure above culture and history. Moving in continental patterns, they react with local particularities that rise into them from below, whether thermal updrafts from a slope of land or band of trees, reflected lake light, or the suspended chemistry of urban pollution. They come, with all their changing, to possess a character that becomes a part of any identity of place. Throughout history, skies have been an information zone, a place of reckoning. Holding prospects of danger and promise, they have anchored a succession of future-minded modes of thinking: from religious belief systems and augury, to weather forecasts and the practicalities of rain prediction. For all that, they are under-realized in the world of images. They have served as backdrops while we looked into the foreground and stopped at the horizon. This is changing. A contemporary weather historian will now look to a Brueghel painting and the cast of its sky as a source of reportage, as a picture that corroborates ice core data of a cooling planet cycle that began with the Renaissance and ended with 19th century industrialization. Affecting ocean currents and air masses, the cycle shaped the world for 500 years and was a generative factor of wars, plagues, agricultural poverty, colonial economies and even children’s fairy tales—in other words, modern history. In the discernible warming climate of our times, the sky is a backdrop no longer. It is a living, contingent space, the vulnerable envelope of breathable air that carries us. The paintings are part of an ongoing project of recording skies where I live in Toronto. I have chosen to paint them because painting engages the complex overlap of seeing and subjectivity involved in looking. Painting can extend time. It is a complement to the way that skies—organs of anticipation and expectation—hold time. One thinks not in discrete measures of seconds, minutes or calendar dates, but in terms of moments—moments where tones shift and conditions gel. This applies to painting too. It is a comparable suspension of things in passing. Noel Harding is an international Canadian artist and urban innovator recognized for his monumental scale public art projects and environmental sculptures that address the role and plight of nature in the midst of twenty-first century urbanization. He is well known for his sculpture The Elevated Wetlands where vegetation lives in recycled plastic soil while cleaning polluted water. In general, his work is an engagement in public urban realities: planning, envisioning, and mapping toward the future, suggesting that much more is possible. Art has a crucial role to play in leading public awareness on timely issues. 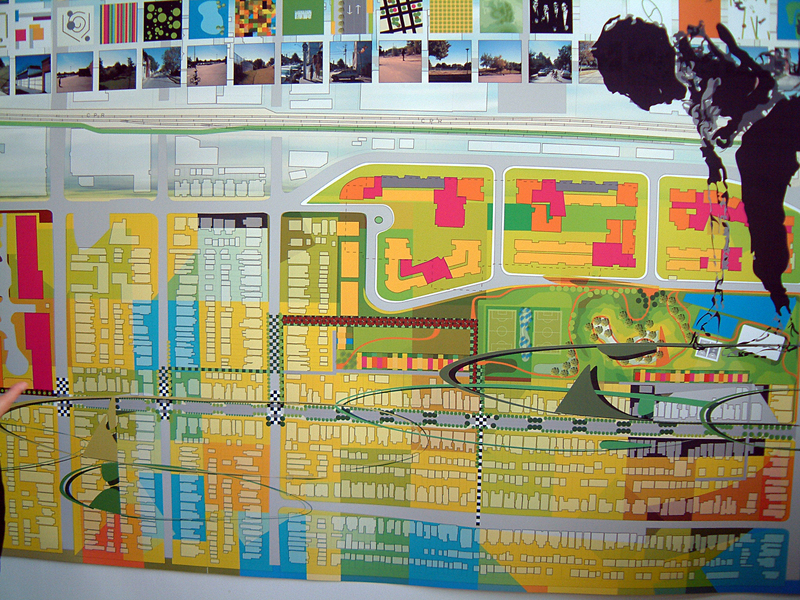 Harding seeks to insert his work into the city planning process as a statement about the role of art in both public space and public consciousness. To realize his large-scale projects he has strategically cultivated vital connections and interactions with teams of diverse professionals within complex contexts including institutions, governments, citizenry and business. From organizing his works into major touring museum exhibitions such as ‘Anti Heroes’ in Moscow, Budapest, Bratislava, and Helsinki, to commissions for major theatrical productions, such as Carrots Rabbits Elephants at The Holland Festival, Amsterdam, he makes evident the capacity to accomplish organizational and technical demands while sustaining creative integrity and popular appeal. Harding has initiated numbers of exhibitions beyond his own works with major institutions such as The AGO. 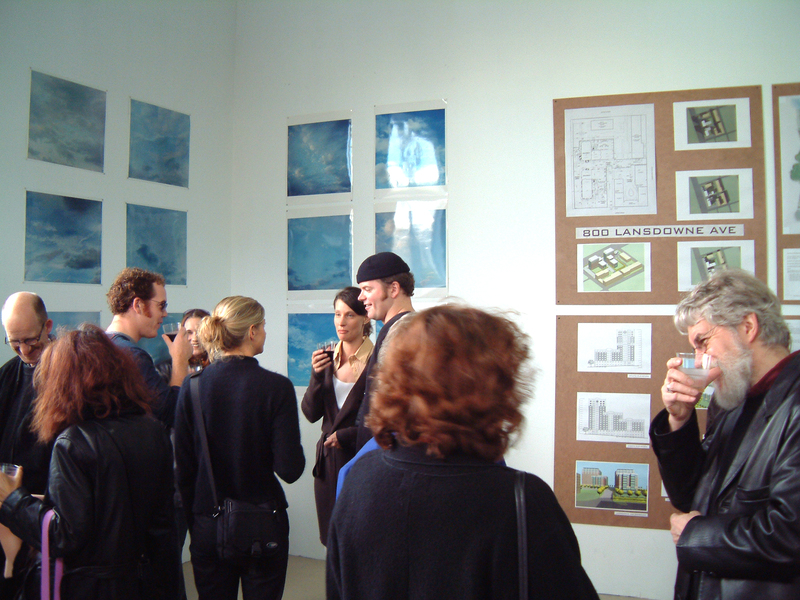 In 2001 Harding organized ‘Starting Now’, an exhibition involving 17 emerging artists from Europe staged at 5 cutting-edge galleries on Queen St. W. In 2002, Harding completed a vision plan for integrating arts and culture experiences at the Toronto Zoo. Most recently, the ‘Green Corridor’ is a ground-breaking initiative for generating a green redevelopment of the international bridge corridor linking Canada to the United States in Windsor, Ontario. Harding is currently on the City of Toronto’s Art Committee for Public Places, a Distinguished Visitor at the University of Windsor and a member of both the Royal Canadian Academy of Art and the International Kunstler Gremium in Berlin. He has taught at many high profile art institutions such as the Ontario College of Art & Design, University of Guelph, University of Windsor and the Dutch Art Institute in the Netherlands, and has lectured extensively internationally. His work has been shown in more than 200 exhibitions, including exhibiting at the Museum of Modern Art in New York, the National Gallery of Canada and the Art Gallery of Ontario where his work is archived in the permanent collections. London and Montreal between September 2005 and September 2006. Come and meet Ward 18 Candidates for city council; Councillor Adam Giambrone, Simon Wookey and others. This is a reception to greet and discuss ideas and concerns with the city politicians, one of whom will be voted into office in November elections for Davenport (Osler to Dovercourt, Dupont to King). Hosted by Dupont Projects and DIG IN: Dupont Improvement Group. Richard Rhodes, painter, writer and editor of Canadian Art presents “The Envelope” a new series of paintings recording the skies of the Toronto neighbourhood where he lives. “With their passing light, vapour and air, skies hover as a shifting zone of alternate structure above culture and history. Moving in continental patterns, they react with local particularities that rise into them from below, whether thermal updrafts from a slope of land or band of trees, reflected lake light, or the suspended chemistry of urban pollution. They come, with all their changing, to possess a character that becomes a part of any identity of place. This is changing though. A contemporary weather historian will now look to a Brueghel painting and the cast of its sky as a source of reportage, as a picture that corroborates ice core data of a cooling planet cycle that began with the Renaissance and ended with 19th century industrialization. Affecting ocean currents and air masses, the cycle shaped the world for 500 years and was a generative factor of wars, plagues, agricultural poverty, colonial economies and even children’s fairy tales—in other words, modern history. In the discernable warming climate of our times, the sky is a backdrop no longer. It is a living, contingent space, the vulnerable envelope of breathable air that carries us. Dyan Marie Projects, a new cultural space of Art, Architecture and Landscape Architecture presents curated and solo exhibitions that explore urban issues, ideas and reflections on contemporary cultural experience. acknowledge the city’s fragile green space and present works that imagine ways to contribute support. Lois Andison Elise Rasmussen Noel Harding. Lois Andison is a sculptor primarily in the field of kinetic art. Every half hour for a period of one year Andison photographed through an upstairs window onto a garden and into an adjacent yard. In the resulting video, one witnesses both small and large changes where randomness meets order and nature and culture mix. Andison will also present a work of light composed in scales of green. Noel Harding, artist and urban innovator is well know for his large-scale environmental sculptures such as Elevated Wetlands where forests live in recycled plastic while cleaning polluted water. Harding’s photographic images suggest that much more is possible. Elise Rasmussen presents photographs of deep night where images of plant life are caught in the glare of brilliant lights. The work bridges contradictory themes such as beauty and desperation, exploring notions of vulnerability, loneliness and isolation. GREEN EYES Seeing from an environmental perspective. Eberhard Zeidler’s drawings, texts, prints and photographs walk through the development process and creative spirit behind the making of Ontario Place. Begun in 1968 and opened in 1971, Ontario Place turned heads worldwide and introduced audiences to wide-ranging cultural performances staged at the Forum, the open-air performance space originally conceived for the site. The exhibition celebrates Ontario Place on the eve of its 35th anniversary and explores both what went right and what went wrong over the course of its history. Mr. Zeidler’s many honours include becoming an Honorary Fellow of the American Institute of Architects, being named Officer of the Order of Canada and receiving the Gold Medal of the Royal Architectural Institute of Canada. His Toronto projects include the Eaton Centre, the Hospital for Sick Children, Queens Quay Terminal and the National Trade Centre, among many others. Where do architectural ideas come from? Jack Diamond offers examples of first sketches that demonstrate the process of his architectural thinking. Small, fluid and changeable, they form the basis for the Four Seasons Centre for the Performing Arts and what might have been The Royal Ontario Museum. Jack Diamond has received the Toronto Arts Award for Design and Architecture, has been named Honorary Fellow of the American Institute of Architects, is an Officer of the Order of Canada and has received the Gold Medal given by the Royal Architectural Institute. He has also been awarded the Order of Ontario. Donald Schmitt’s elegant and functional architectural work incorporates sophisticated environmental approaches that are sensitive to resource issues and facilitate atmospheres of community. The Bahen Centre for Information Technology is a place for high-tech learning that integrates innovative heating, cooling, lighting, stormwater collection and greywater irrigation systems. It raises the bar on the implementation of environmental design in response to changing technological needs and resources. Donald Schmitt has won more than 90 design awards including five Governor General’s Awards. He is the Founding Chair of the City of Toronto’s Public Art Commission. Johnson Chou, Beth Howe, Michael Merrill and Guy Walter. Dyan Marie Projects presents Under Construction with Johnson Chou, Beth Howe, Michael Merrill and Guy Walter. The exhibition explores places where artworks are created and exhibited. Under Construction runs September 17 to 24, with an opening reception September 17 from1pm to 6pm in co-ordination with the Canadian Art Gallery Hop and the Queen Street West Art Crawl. Johnson Chou, designer and founding partner of Archive Inc. His recent projects include the Museum of Canadian Contemporary Art (MOCCA). 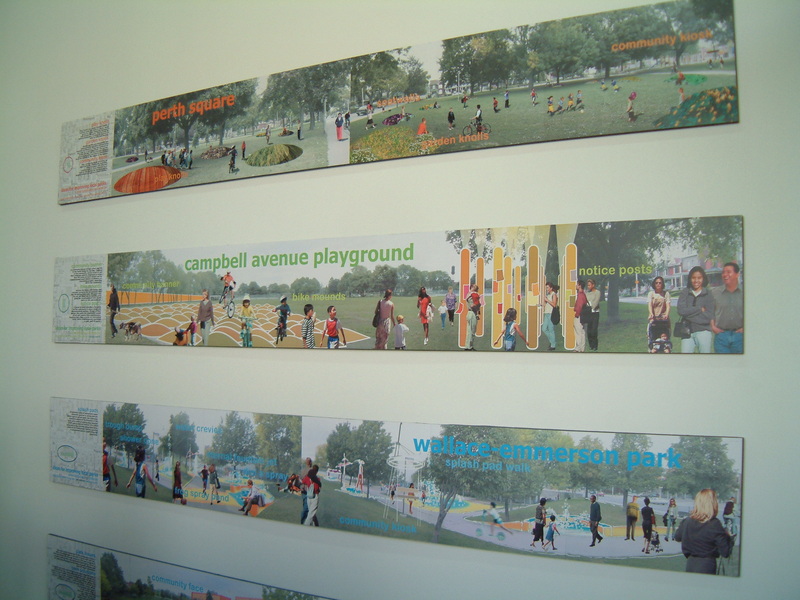 Johnson will exhibit architectural design plans developed for Dyan Marie Projects. Beth Howe, artist and instructor at the Ontario College of Art and Design. Howe’s architectural landscape drawing in thread, stitched into paper, explores the 1444 Dupont area. Michael Merrill, regular exhibitor with the 1980’s painting group Chromazone, and current resident of Montréal. Merrill offers paintings and drawings of spaces where art is exhibited, prepared and made. A new contemporary exhibition space, Dyan Marie Projects, opens in Toronto September 17, 2005, at 1444 Dupont Street, Unit 31. It features curated and solo exhibitions that explore urban issues, ideas and reflections on contemporary cultural experience. Since 1997, Dyan Marie has focused her curatorial and artistic practices on the Lansdowne and Dupont neighbourhood where she lives. 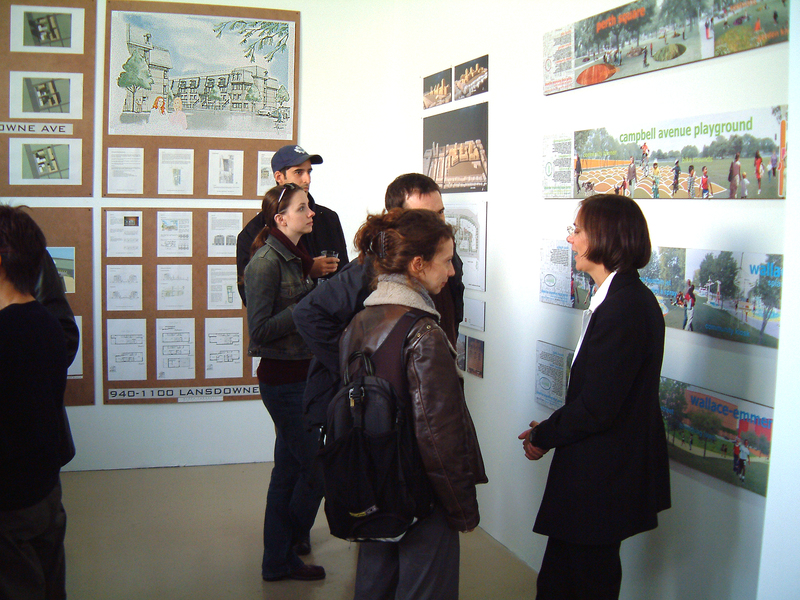 Marie has developed interventions and exhibitions that involve art and community activism, including About Here, which explored local development, Walk Here, which created an art-embedded walking system, and Look Out: Look Here, a project that promoted walking to reclaim neighbourhood streets after the brutal murder of a local child. Dyan Marie Projects builds on this background of neighbourhood revitalization work by introducing a cultural commercial space into an area caught between longstanding neglect and increasing pressure from developers of enclave bedroom communities. Dyan Marie Projects opens on the eve of the 20th anniversary of Cold City Gallery, a commercial artist-run gallery founded by Marie to exhibit the work of artists from the 1980’s Queen Street West scene. On September 17, Dyan Marie Projects opens a fall season encompassing art, architecture and landscape architecture. It begins with Under Construction a project exhibition that coincides with the construction of the gallery, the Canadian Art Gallery Hop and the Queen Street West Art Crawl. Toronto landmark cultural architecture projects by leading city architects. Seeing from an environmental perspective.